As I write, spring is threatening to break out in Minnesota, but winter doesn’t seem quite willing to let go. So how about a photograph of summer on the Minnesota prairie? I’ve recently finished this panorama from the Jeffers Petroglyphs site in Cottonwood County, located in southwestern Minnesota, not far from where I grew up. This is a remarkable and sacred place where, across the span of more than 7000 years, Native Americans have carved more than 4000 petroglyphs into the very hard Sioux quartzite rock that rises out of the prairie to form a ridge. 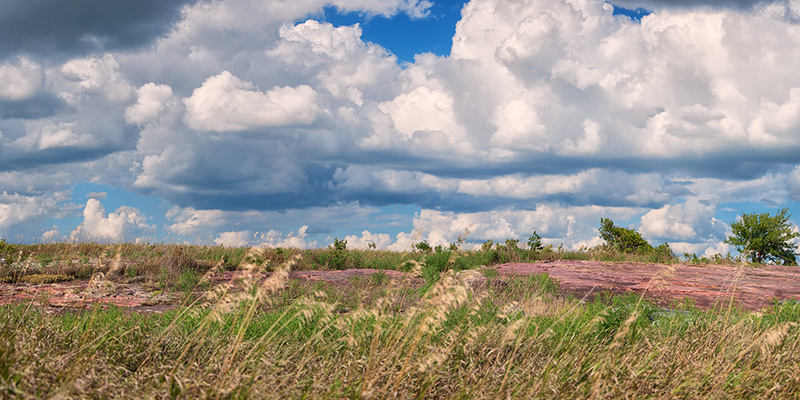 Here we see the outcropping of the reddish rock emerging from the prairie grasses, all under a beautiful summer sky. The panorama was made from 5 images taken with a Nikon D90 stitched together with Autopano Giga software, with additional adjustments made within Photoshop. The full-sized image is 26.1 megapixels (which at a fairly high resolution of 300 pixels per inch would make a print of approximately 24×12 inches).